In marine turbine, the heat exchange is undoubtedly a very critical factor to ensure the normal use of the engine. Because when the turbine is working, it needs to maintain a certain temperature to ensure the normal operation of the machine. There are many kinds of heat exchangers used in marine engine, in which plate heat exchanger is one of the very important one, and will be the very popular potential equipment on vessels in the future. The heat exchanger has been one of the indispensable equipments in marine engine, which can be applied in the main and auxiliary oil cooler, cylinder liner fresh water cooler, fuel heater, steam condensers, water heater and other equipments. 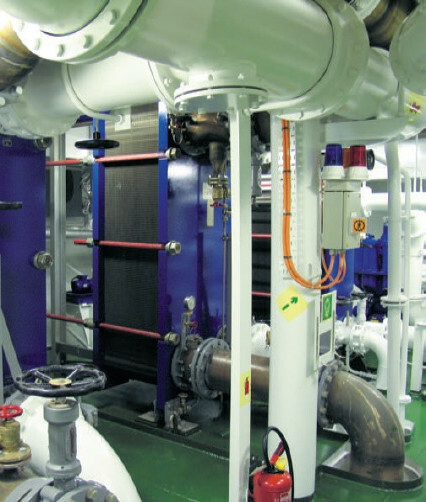 The special working environment of the ship has very special demanding on the heat exchanger, including the factors such as instability in the sea, which may encounter vibration, shock, large angle tilt and noise. The cooling medium is usually seawater, which is with high salt concentration, high humidity of the working environment, and very strong corrosion of the plate. The marine itself is very compact in structure, having more stringent restrictions on the heat exchanger space and quality. The heat transfer medium of traditional heat exchanger is always water, and the heat transfer medium of marine heat exchangers is generally oil and water and so on. The emergence of plate heat exchanger effectively solves a large part of the problem. 1. The equipments for vessel requires compact structure and small quality. At present the plate heat exchanger, used in the ship turbine is generally considered smaller than the traditional heat exchanger, with very small volume. For this purpose, finite element analysis is used. At the same time, in order to meet the requirements of marine equipments, the unnecessary parts of the plate are removed or reduced according to the actual stress and strain distribution, and the weak parts are locally thickened. Put gas cutting method on the whole body to reduce the influence of welding deformation on the strength, and weld together the inner plate and the panel, then eliminate the residual stress. It will be able to make the use of equipment as much as possible on the installation in limited space, to bring more benefits; it will complete the heat transfer work to ensure the normal use of the marine. 2. The equipments for vessel must be for the impact power, large angle shaking, vibration and other issues. Since many turbines are in direct contact with seawater, they have a very large effect on the heat transfer medium during use. Therefore, at present, the plate used in the turbine is usually made of a material with high corrosion resistance, such as titanium material, and its quality is much smaller than that of stainless steel. In order to ensure the quality of the titanium plate, in addition to the routine inspection, the plate is also subjected to 100% color penetration test to further eliminate the error when the board is sampled. Since the specific heat capacity difference between water and oil is relatively large, the temperature difference is larger during the heat transfer process, and the heat transfer coefficient is also larger. In order to make the product reliable and economical, it is necessary to ensure the oil-water heat transfer performance under the ship working conditions to ensure that the equipment has a certain heat exchange margin. Only when the heat medium can effectively conduct heat, can the heat transfer effect be achieved. Plate heat exchangers are inexpensive and its production process is very mature. During production or maintenance, we can reduce costs and increase efficiency as much as possible. It can be cleaned by loosening the screws in the mounting structure and reassemble to use again. If it is already damaged, then we can just change a new one. Its low price enables it be prepared in emergency equipment. Some of the mechanical equipment in the diesel engine power produces heat in the normal operation. The heat must be distributed in time; otherwise the heating element temperature will continue to rise, more than allowable limits and will damage the reliability of mechanical equipment. In order to distribute these calories immediately in efficient manner, in common let a certain amount of liquid to flow continuously through the heat sink and bring the heat out of the equipment. Cooling systems typically use fresh water, seawater or river water as a cooling medium. A lot of heat took away by cooling system is residual heat burn done by fuel, generally about 20% to 30%. As the diesel engine is one of a heat engine, is to rely on the combustion of fuel heat to work, so it is loose to take away the heat. Obviously, the more the intense of cooling, the greater the loss of this part is, and the more obviously the reduction of diesel economy. On the other hand, since the temperature of the heat-receiving member is high, the average temperature in the inner wall of the cylinder can reach 200 ° C to 300 ° C, and the surface temperature in contact with the cooling water is low, the thermal stress is liable to occur at such a temperature difference. The temperature difference is too large to crack the part. It can be seen, the diesel engine has strict requirements on cooling process. The effect of the cooling system is to cool the diesel engine forced, the temperature of each heated part is controlled within the allowable range and at the same time maintain the proper cooling water temperature and use the proper cooling medium to ensure its normal and reliable operation. In determining the temperature of the cooling water, it is necessary to take full account of the lack of cooling or excessive cooling. Such as the lack of cooling will make the parts overheated, resulting in mechanical properties of materials decreased, so as to have thermal stress and deformation, damaged the surface normal gap, also resulting in wearing excessively and even damaged. Cooling will also bring too high oil temperature; shorten the service life of oil to cause oil deterioration and coking, destruct oil film to loss lubrication. On the contrary, the excessive cooling will allow the coolant to take too much heat, reduced the diesel economy. While using oil with high sulfur, the excessive cooling will make the cylinder to form sulfuric acid and corrosion of the cylinder wall and piston. Therefore, the thermal equilibrium calculation of the cooling water system is very important. ① main and auxiliary diesel engine. Including cylinders, pistons, injectors and superchargers. ② Main and auxiliary diesel engine oil cooler, fresh water cooler and other heat exchangers. ③ shaft bearings and so on. ④ air compressor, condenser and other equipment. ⑤ other mechanical equipment or heat exchangers. Such as air conditioning, refrigeration units, deck machinery, hydraulic systems. In these machinery and equipment, the main engine need more heat dissipation. So the ship cooling system constitutes a cooling system with the main cooling pipe as the center, other machinery and equipment cooling pipe, and a variety of cooling auxiliary equipments together. The open cooling water system refers to the diesel engine is cooled by itself directly by outboard water or river water. The advantage of the open system is that the unit is easy to manage and maintain. The disadvantage is that the quality of outboard water is poor, the river water contained impurities and seawater contained a variety of chlorinated salt, which will block the cooling space or cause corrosion of the parts and produce scale to reduce thermal efficiency. For the precipitation of salt, the sea water temperature should be below 50 ~ 55 ℃, high temperature parts cannot be used. Because the diesel engine cooling water temperature is generally above 60 ℃, high speed machine should reach 80 ℃ ~ 90 ℃. So now in addition to river boat, the open system is not applied. ⑴ cycled in the machine is clean fresh water, not easy to clogging. ⑵ clean water is not easy to fouling, to ensure good heat transfer effect and extend the service life of components. ⑶ not subject to seawater precipitation of salt temperature limit, can use a higher cooling water temperature to improve thermal efficiency. ⑷ shorten the warm cylinder time, improve mobility. When the tank is warm, the fresh water does not pass through the cooler or closes the seawater. In order to make the mechanical equipment other than the host enigine are also use fresh water, and with a system cooling to form a central cooling water system. If some of the equipments are cooled with sea water alone, which is called mixed cooling system. In the diesel fresh water cooling system, there are high temperature water circuit and low temperature water circuit. For example, the use of high and low temperature water system parameters, it is a mixed-flow central cooling system; if the high and low temperature circuit separated, and it is the independent central cooling system. In a independent central cooling system, if high-temperature water heat exchanger cooled with low-temperature water fresh water, it is the independent type Ⅰ, if the use of seawater to cool high-temperature water, known as the independent type Ⅱ. In some high-speed ships such as container ships, ships, etc., its central cooler low-temperature fresh water cooler, also known as bucket cooler, can also be designed to cool the seawater obtained by the speed of the ship's sailing, called the self-flow central cooling system, which is a special form of the independent type I.
Cooling water system can be divided into seawater cooling system, fresh water cooling system. And fresh water cooling system can be divided into low temperature water cooling system and high temperature water cooling water system (also known as cylinder water cooling system). Large-scale ships mostly use central cooling water system, so the system can also be combined together known as the cooling water system. Here we introduce the conventional seawater cooling system and the independent central cooling water system. Conventional seawater cooling system consists of two seawater cooling pumps, oil coolers, cylinder water coolers, temperature control valves and return lines and other components. Its working principle is the sea water pump inhale the sea from the seawater gate and seawater pipes, and then divided into two ways: one way is to the host of the air cooler, another way is to send sea water into the oil cooler, and then after the fresh water cooler flow together with discharged water from the host air cooler, through the three-way thermostat directly go outboard or back to the seawater pump inlet. Due to the influence of the seasons or sailing areas, the temperature of the seawater is always changing. Therefore, a three-way thermostatic valve is installed on the pipeline of seawater discharge. When the sea water temperature is lower than the set temperature, the seawater is returned to the inlet of the seawater, to improve the temperature of the sea water. The opening and closing of the three-way thermostatic valve is controlled by the temperature sensor installed on the outlet pipe of the sea water pump. The ship is usually at least two seawater doors, arranged on both sides, and as low as possible. One of the three can also be a high sea water door; one can be a low sea water door. In the shallow waterway sailing can use high sea water door to prevent the inhalation of sediment. But for safety reasons large ships are set up three sea water door, one high sea water door, two low water door. Seawater should be cool lubricating oil first, and then cool fresh water by fresh water cooler to. This is because the oil temperature is lower than fresh water, and the viscosity is high, its heat exchange performance is worse than fresh water. The working principle of the independent type Ⅰ central cooling water system is that the system consists of three separate circuits, namely the seawater circuit, the high temperature freshwater circuit and the low temperature fresh water circuit. Seawater circuit is quite simple, two seawater pump inhaled seawater from the seawater mains sending into the central cooler, cool low temperature fresh water directly discharged to the outboard. High temperature fresh water circuit (the host cylinder water cooling system), is a closed loop system. Two high temperature fresh water pump will send high temperature fresh water into the host of the cylinder, piston and injector cooling, and then discharged from the highest point of the main engine, after the three-way thermostat valve, high temperature fresh water cooler or bypass pipe, and gas cabinet back to the high temperature fresh water pump suction port. In the host fresh water discharge pipeline, installed parallel a water machine or a light system, using high temperature fresh water waste heat to make fresh water, as added fresh water on board to use. It is an energy-saving device. 2) Expel the vaporized gas in the pipeline due to local heat out of the system. Thus at the highest point of fresh water exports are generally connected a ventilation pipe, and connected with expansion tank. The cryogenic freshwater circuit is also a closed loop system. The whole loop is the same as the conventional seawater cooling system, but itselt must also be cooled by seawater. In the actual ship, low-temperature water is also divided into several ways: diesel generators air coolers, air compressors, air conditioning, refrigeration, atmospheric condensers and other cooling. The system is much more complex. The three-way thermostatic valve in this circuit is installed in the central cooler outlet. The outlet temperature of the cryogenic fresh water cooler is generally controlled at 36 ° C. It also installed a special low temperature water expansion tank. Where the system is located in two pumps, one of the pumps is spare and required start automatically and make conversion. The difference between independent type Ⅱ central cooling water system and type Ⅰ is that the central cooler called low temperature fresh water cooler is cooled by the sea water the same as high temperature fresh water cooler, whose working principle and system are basically the same. In addition, the position of the cooling pump and the cooler in the closed circulatory system can be varied in two different ways. The main difference between the two arrangements is whether the fresh water pump is directly connected to the fresh water inlet line or the outlet line. The fresh water from the cooling pump first enters the main engine inlet, which can keep the cooling water in the host to maintain a high pressure, so the cooling water in the cylinder cooling chamber is not easy to vaporize, which can guarantee the good cooling effect of the diesel engine. The disadvantage of this arrangement is that the the pressure of the cooling water from the host entered the cooler has been reduced and the seawater may leak into the fresh water occurred at the cooler tube sheet. Fresh water through the cooling pump out, first into the fresh water cooler, and then to the host of the components to cool, and finally return to the cooling pump suction port. The advantages and disadvantages of this arrangement are just opposite.